I've been aiming to do new hare and animal drawings (pencil and biro) every week, but somehow don't seem to be getting round to it! Life has become very busy, which is great; but as a consequence of this some things are just slipping by and falling off of my 'to do' list. You may have noticed that my online shop is sadly lacking in drawings, because I need them at my art shows and craft fairs - and they are selling faster than I can draw them! 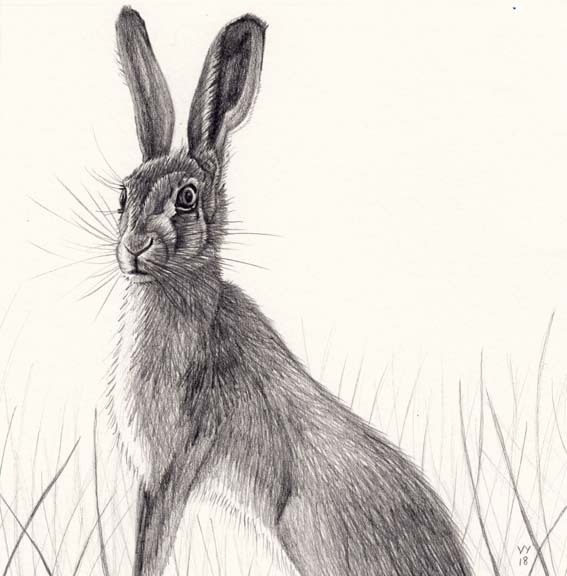 Anyway, this is one that I did yesterday, a pencil drawing of a hare in long grass. I don't usually name my pencil drawings, but perhaps I should? 'Hare in long grass' is a bit dull! I'm always happy to accept name suggestions! This one won't be in my shop, but is for sale £25 plus p&p £3 - just email me vikki_y@yahoo.co.uk or Facebook message me. To follow my blog, please join my Facebook page Vikki Yeates Illustration, as I always put a link to my new blogs here.